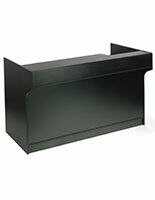 Cash wrap furniture acts as a checkout counter to complete transactions! 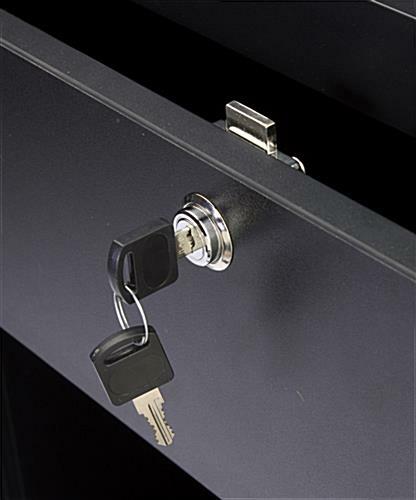 Sliding drawer has lock for security! 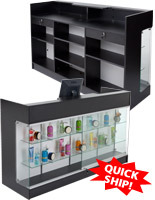 Height-Adjustable shelf offers jewelry counter storage options! Ships fully assembled for quick & easy setup! 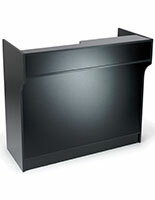 This recessed-top cash wrap furniture is the perfect addition to an existing configuration! The display is ideally used as an area to cash out customers. 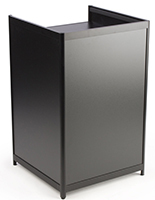 The cash wrap furniture that is in stock, also known as a store fixture, is not only a place to conduct business, but also to store goods. 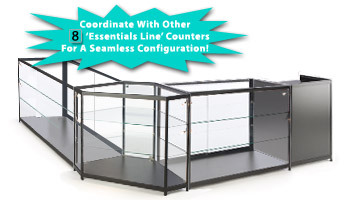 This can be used as a stand-alone unit or sandwiched between glass display cases to create an entire configuration! 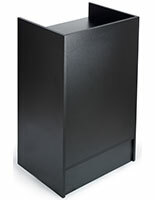 The stark black cash wrap furniture is a nice contrast to clear, full-vision fixtures. This unit coordinates perfectly with the Essentials Line of displays. 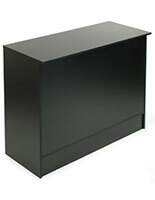 This checkout counter, cash wrap furniture that stands 38" tall is the ideal height to encourage interaction between store associates and patrons. 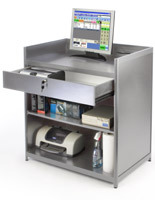 It is often used as a check out stand, with a PC or touch-screen monitor and money drawer. 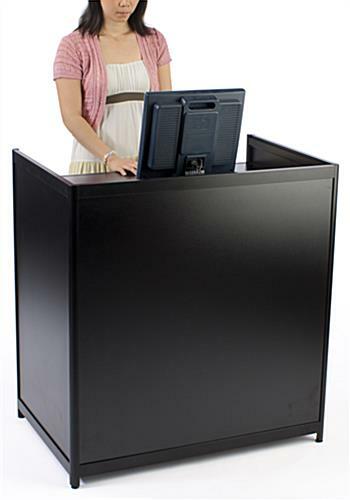 The podium-style case could even be used as a hostess or valet station. The display includes many great features to ensure longevity and ease of use. 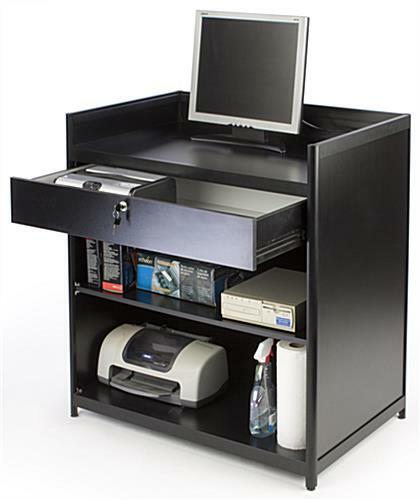 The large drawer includes a lock & keys to secure money or valuables. There is also a shelf that is fully height-adjustable to store items or keep back-stock of varying heights. 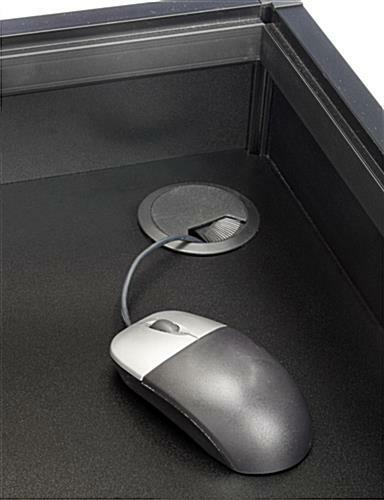 Three cord-management holes are vertically aligned within all horizontal surfaces to keep cords and wires neat. 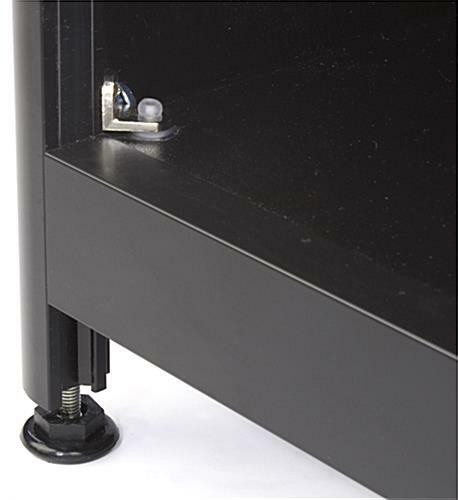 Adjustable floor levelers ensure the store fixture is stable, even when placed on virtually any surface. This light weight case ships fully assembled. 35.0" x 38.0" x 23.8"
31.5" x 3.9" x 17.0"
My order was not delivered but I was charged. I called Displays2go first and they said that it was never picked up from them (not my problem but, ok just fix it as soon as you can). They asked me to call their freight company which I did and the freight company called Displays2go to figure it out. Nothing happened so I repeated this process multiple times. I have emailed “customer support” in addition to my calls several times over the last week and only received one reply saying they had my order on file and “that it might take awhile”. This was the last piece of equipment I was waiting on to open my business and I expressed that multiple times to the “customer service” reps. They have my money and will not even call me back to let me know what’s going on. Terrible service. My company will never use them again and I plan on disputing the credit card charges. Hi Mark, Thank you so much for the helpful feedback. One of our customer care specialists will be reaching out to discuss further. Thanks! We needed a new front counter area for our retail store since we couldn't take our old one with us when we moved. This made the perfect fit for our registers when these came in. Plenty of storage below too for needed items behind the counter. Great product so far. Will be interested to see how it holds up under normal shop wear and tear. THE PRODUCT IS WELL CONSTRUCTED AND THE SHIPPING TIME WAS EXCELLENT. WE JUST ORDERED A 2ND ONE TODAY. We order these for our stores they work out great! This is a great product for us!